This page is dedicated to offer information on the Finnish made King´s Cruiser 33 by Fiskars to help you to assess this boat, maybe to find pros and cons in a decision process of buying one or not. Kings Cruiser 33 have been built between 1972 and 1978, a total of some 150 boats have been built – although other figures speak of a fleet in excess of 200 boats. It´s a hand-laminated full GRP built IOR-construction drawn by Swedish sailing legend Pelle Petterson, who by the way is still involved in yachting as designer for Polish Maxi Yachts. King´s Cruisers have been built by the Turun Veneveistämö Oy Abo Batvarf AB of Fiskars in Sweden. This yards doesn´t exist anymore, remainders have been sold to famous aluminum-boat builder Buster Boats. Ad Picture of a King´s Cruiser 33 under full Canvas. By the way, Fiskars is one of the oldest known branded corporations of the world, still existing and manufacturing gardening tools, most famous in Europe for the Fiskars scissors of high quality. You may find a whole archive of Kings Cruiser 33-dedicated articles here in this magazine by browsing through the list of all related articles to the hashtag #kingscruiser33. If you have any questions on the King´s Cruiser 33, please don´t hesitate to drop me some lines by utilizing the contact-form. The King´s Cruiser 33 is a GRP-classic and has a very loyal fan base of owners especially in the Scandinavian countries such as Denmark and Norway, though I know of not least than 4 German owners. Of the once built fleet a lot of yachts are still around which speaks in favor of the quality and durability of this build. Technical data. 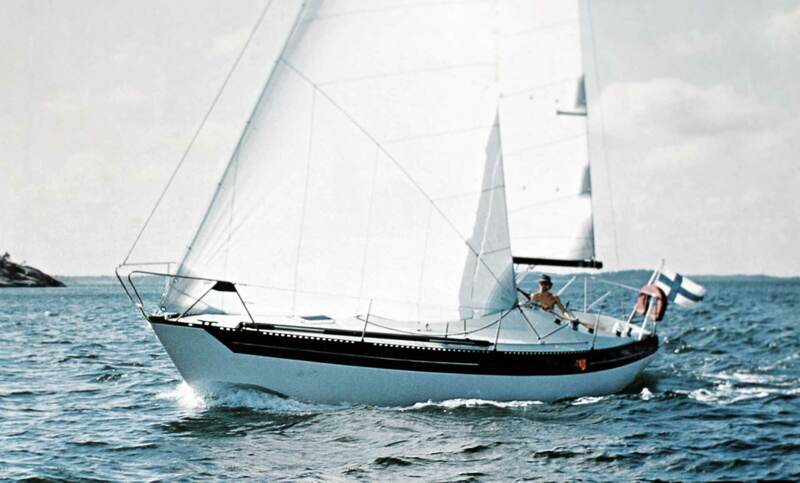 The main technical data of this sailing yacht are listed here. This yacht has a displacement of 4.6 tons (10.150 lbs) and offers a very stable weight/ballast ratio of exactly 2.0 with 2,3 tons (5.075 lbs) of ballast in the cast iron keel. This is 50 % ballast! Most of the King´s Cruiser owners I know of do sail the boat exclusively with main and Genoa with a Furlex-reefing to reduce sail in stronger gales although running an additional cutterstay to cast the Jib and having the furled Genoa permanently at the forestay may be the most practical and elegant solution – as it is the case with my SY OLIVIA. Engine. The original King´s Cruiser 33 is equipped with a 25 hp Volvo Penta MD2B Diesel engine. A pre-owner of my boat did substitute the original engine by a more modern and durable Volvo Penta MD 2030 with 30 hp that now reached half of its engine life. It pushes the boat with up to 8 knots, cruising speed at 1.800 rpm is 6.5 to 7 knots. Power is transferred via fixed shaft onto a 3 blade folding propeller though there are a lot of different propeller configurations out there. The engine will be fed from a large 100 liters / 26 US gallons of fuel, which can last a whole sailing season if used just for port maneuvers. Building quality & construction. The King´s Cruiser 33 is a build of the early era of glass-reinforced fiber when building costs – along with costs for the material itself – have still been low. This leads to a very strong and thick build making the boat almost immune against osmosis. I do not know of a single case of osmosis in a King´s Cruiser 33. Near the massive underbody structure around the keel the thickness of the outer GRP hull has almost that of an arm! 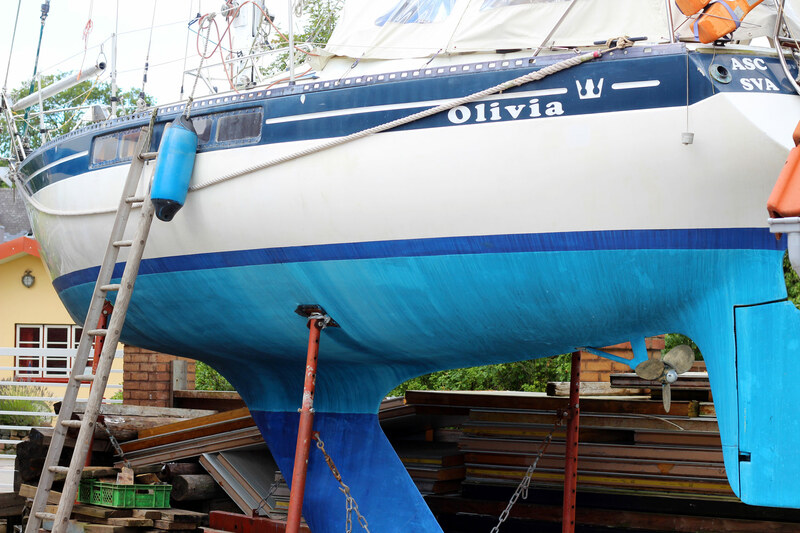 The hull is constructed of an outer shell of different thicknesses from keel to freeboard, above waterline the thickness is around thumb-thick. Both rivited, laminated and screwed into the outer shell is the inner shell made of GRP with a thickness of some 5 millimeters. This inner shell comprises also all cupboards, bunks, galley etc. which adds to the weight but also to an enormous amount of durability because not a single thing is laminate onto the hull – it is the hull. Boats of that early era are built very thick and sturdy which makes them very interesting to look at when considering buying a used yacht. Even after 40 years – presupposed no major incidents occurred – the principal conditions of the structural built should be fine. The first batch of King´s Cruiser 33s did feature a stepped mast which in most cases that I heard of is a cause for trouble. Over the decades the stresses of the load that was brought into the mast causing it to bend made the aperture in the cabin roof to wear out: Constant leaking through the ceiling at the mast and – worse – a rotten inner Balsa core can be a problem. 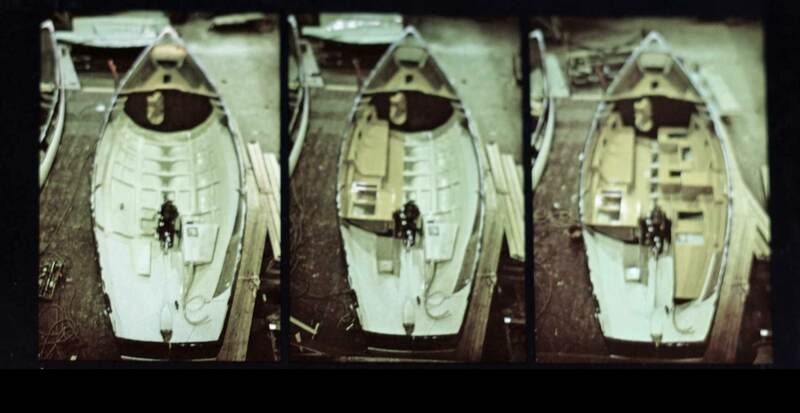 Later (and most of the) boats do feature a mast founded on mast shoe on the cabin roof, supported by a steel construction which is stepped on the keel. No problems with sealing this configuration. Interior Appearance. 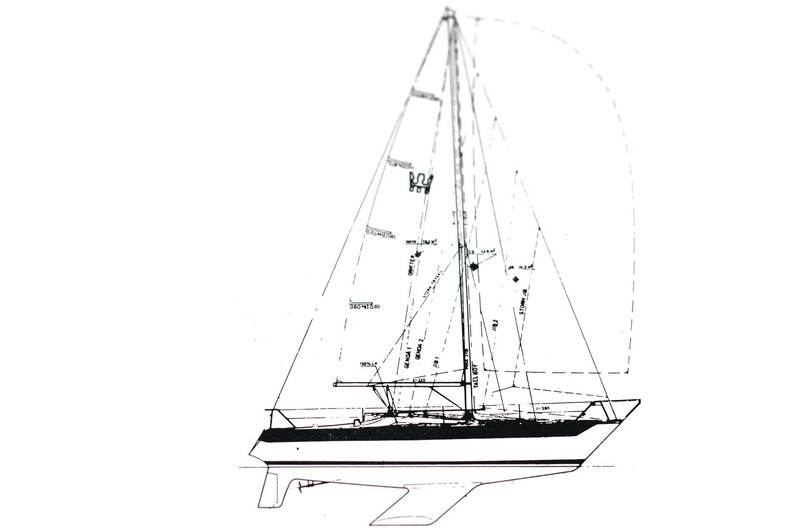 A King´s Cruiser 33 is of the International Offshore Rule (IOR) generation which means that she has a beamy hull (outward bent freeboard) and a narrow stern. This adds for very smooth, nice and still fast sailing abilities plus a very seaworthy hull but has also some downsides. First of all a new owner should be aware that this boat doesn´t offer a full scale aft-cabin which is standard on modern boats with wider sterns. Instead, there´s a quarter berth. If you can live with that, the King´s Cruiser 33 is a very spacious boat, especially in the saloon which offers an almost luxurious amount of space with a large settee on the port side and a very large U-settee on starboard, a large folding table and lots of stowage around. A galley on the port side comes with a full scaled fridge, a big sink, mostly a 3-flamed stove and again enough stowage, the navigation area on starboard side is facing forward and comprises a comfortable working area for the skipper. There´s a head between saloon and fore cabin – cramped by today´s standards but absolutely sufficient, wasting no precious space – vis-à-vis a large drying closet. Both feature doors which can also be used to close off saloon from forepeak or fore cabin from entryway. 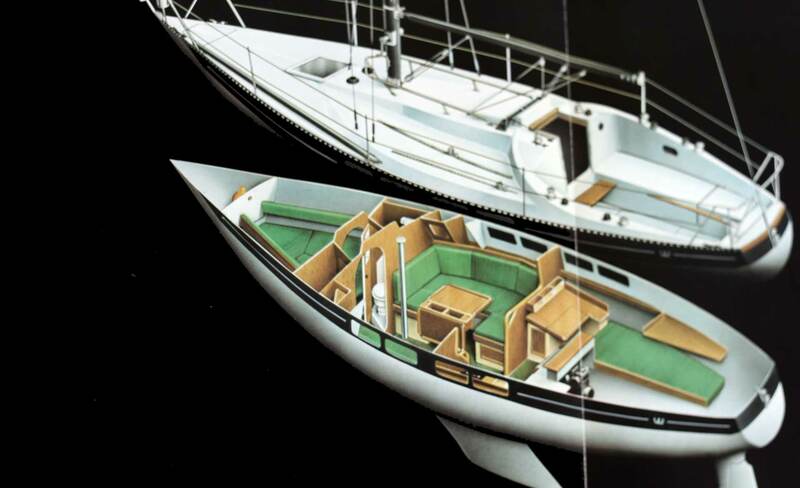 Design and Comfort: Though this is a boat of the Seventies I would say the interior is classy and still modern. A King´s Cruiser 33 features a lot of wooden surfaces, built with massive plywood with Teak-veneers. It´s cozy, a classic ship-like appearance that still appeals to, I would say, contemporary taste. What I don´t like in particular is the yellowish-color of the GRP surfaces inside the boat. During my refit-program I did sand off this gelcoat-layer and re-painted all internal GRP-areas in modern, clean yacht-white, which looks awesome. Also, the standards green colored cushion is a bit odd in my mind and I am going to replace this by a more yachting styled blue. Nevertheless: Comfort level in a King´s Cruiser 33 is very high. Berths & Accomodation. The King´s Cruiser 33 offers 6 berths. Two berths in the fore cabin, one on the port side settee, two in the complimentary settee and a quarter berth in the starboard side aft section. Though the cockpit offers some space too, I wouldn´t advise to go on a cruise with 6 people on that boat. A party of four will thus find this yacht sufficient in terms of sleeping space. The King´s Cruiser doesn´t have standing height at all except for the galley and navigation station, some 1.70 meters in the saloon, around 10 centimeters less in the forepeak. In her original configuration this yacht comes with big portholes in the freeboard, illuminating saloon, galley and navigation station. There is – in her original fitting – no skylight or additional portholes in cabin, just one additionally in forepeak. Most of the King´s Cruiser 33 I know of have been outfitted their Kingscruisers with additional portholes and skylights, such as it is the case with my yacht which has a large skylight on the port side over the oven-stove and a smaller one in the head. To sum it up, a King´s Cruiser 33 is an old school cruiser with a lot of soul and style. Stowage. There is plenty of available, no problem to outfit this boat for a Blue Water cruise or even a circumnavigation, of which at least one Kings Cruiser 33 has completed one. Starting in the fore cabin there are three holds right under the berths, another stowage in the drying locker, plenty of different holds down in the settees and in the back rests of them, in the galley as well and of course under the cushion of the quarter berth. Most owners I know of utilize the quarter berth for a large hold as well to store sails for example. No worry: This boat is huge in terms of stowing stuff! 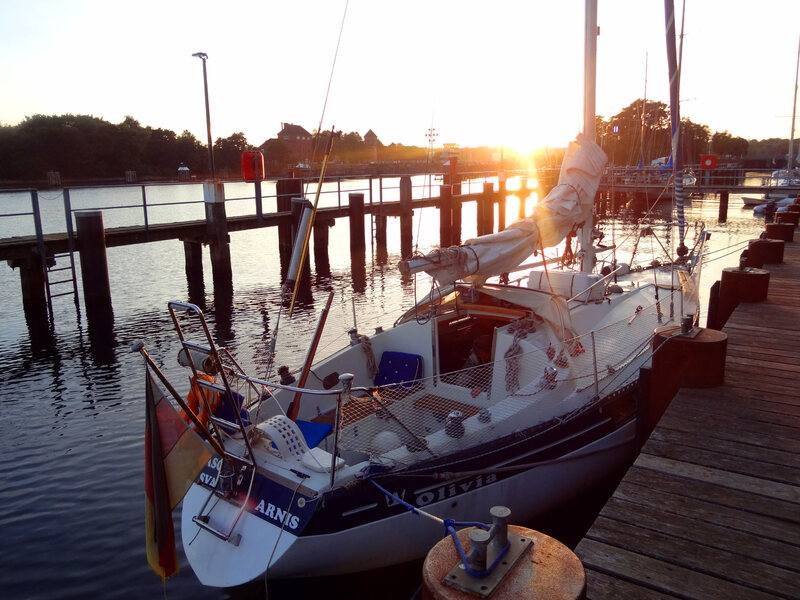 Before I bought mine I did check the boat thoroughly, had a second check with a friend who is a professional seafarer and did a 4-hour-sailing trial (under engine as well) – and just simply fell in love with that boat. Above all, the ship did also appeal to my wife which really is a huge factor: Everybody should feel at home in a boat. My King´s Cruiser 33 SY OLIVIA. Sailing her was sheer pleasure. Even in light winds during our transfer cruise I didn´t had the impression of going much slower than modern yacht, though a King´s Cruiser 33 isn´t a performance-cruiser. Right now the boat is undergoing a complete refit-program, which can be read from day one to present day here. Why buying Kings Cruiser 33 as a used Yacht? You are playing around with the idea to buy a Kings Cruiser 33? Then congratulations for considering one interesting and beautiful sailing yacht! I hope this list can help you to find out if the boat in general and a particular yacht is worth your money and will suit you. Rudder bearings tight, no clearance? King´s Cruiser 33 have wide range of pricings, beginning at around 17.000 Euros up to 26.000 Euros. I would suggest to opt for the more expensive boats thus indicating a better overall condition, unless you plan to have fun and take pride in a thorough refit of this beauty as I do. Having her interior fittings refurbished completely I was able to achieve a very low price for my boat – being aware that some 15.000 Euros will go into the ship during the course of the refit itself. As you may see in the graph below first is the grey vs. colored graph. The grey part was the initial plan. I know (now) that this way way too optimistic. First I really underestimated how much time I will finally get to work at the boat – it´s far, far less than thought. Secondly, the work takes much, much longer than anticipated because I am no skilled craftsman. I have to learn how to fix things, how to make things and I am having setbacks all the time forcing me to restart my efforts regularly. Third reason: Every time you fix and finish one item on the list, two new will appear. That´s especially when you “look behind things”, take off panels or take a look behind a veneer. In such an old boat there are new items for the list virtually everywhere and one has to be very, very enduring not to give up – because there´s new tasks coming in all the time. 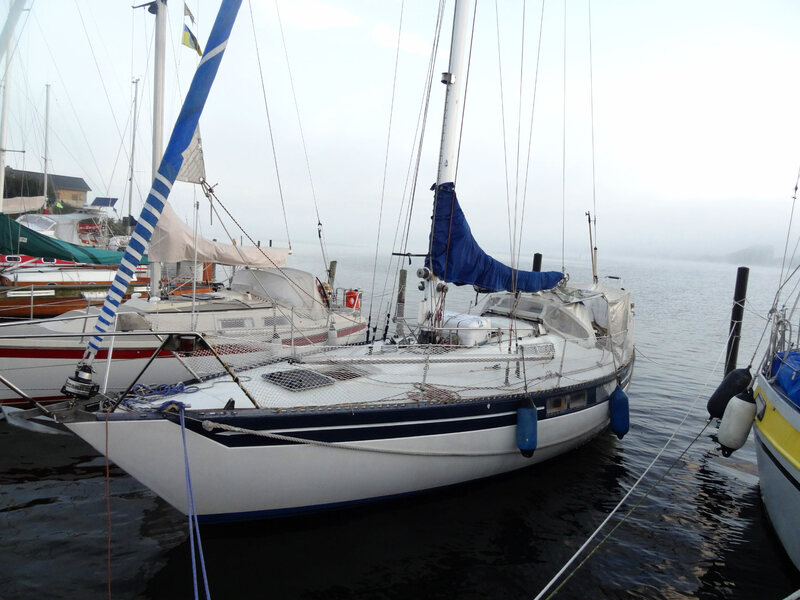 You may browse all refit-related articles here and all articles related to the King´s Cruiser 33. If you have questions or hints please feel free to write an E-Mail by utilizing this contact-page. I particularly like the story of three young men going Transat in their King´s Cruiser 33 which you may read here and a very nice story of the sailing yacht ZIRKON and their refit project. There is a Danish-based King´s Cruiser 33 “fanclub” which you may find interesting to browse to here. More technical data may be obtained here at Sailboatdata.com though there are some inaccuracies here.